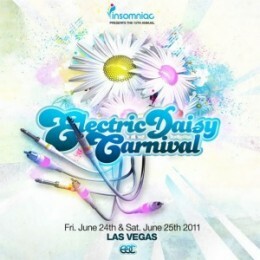 This scene is a microcosmic example of what went on at 2011s installment of Electric Daisy Carnival. Upon arrival, I felt like Will Smiths character. As I descended the innumerable steps from the bleachers to the racetrack, I had to concentrate very hard on not tripping and falling. My eyes kept getting stuck on the bedazzling display encompassing the thousand-acres of the Las Vegas Motor Speedway  massive stages, glimmering neon art installations, full on carnival rides, and lights and lasers galore. It was a world I didnt know existed. Ive been to my fair share of raves, but this was different. Just looking out across the raceway, I knew that this was the rave to end all raves. It was definitely worth it in the end. But that doesnt automatically pardon all the hurdles it took to reach the end. Strength was absolutely a factor both physically and mentally. The festival ran from eight pm to six am every night to avoid the scorching daytime desert heat, which was only effective to a point as desert nights are only slightly cooler than the days. After three days of uncomfortable heat, immense overcrowding, complete sleep deprivation, and poor organization on the festivals part, even the hardiest candy kids were pretty worn out. But it was all worth it. 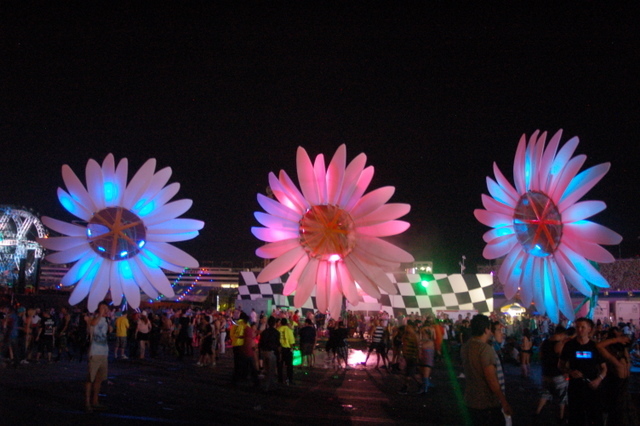 Electric Daisy Carnival successfully pulled off throwing the largest dance festival outside of Europe (you know, because Europe festivals > US festivals), and they did it without much public scrutiny. After last years debacle involving the death of a 15-year-old girl and dozens of hospitalizations, and the ensuing blame game with the city of Los Angeles, EDC decided it was best to pick up and leave the city entirely to find a new home for what would be its 15th installment. And they couldnt have landed in a better place  a city founded upon lavish consumerism and bright lights  Las Vegas, Nevada. Financially speaking, it was a mutually beneficial situation for both the festival and the city. The festival brought in an average of 80,000 attendees a night, all of whom needed hotels to stay in and food to eat, leaving the city of Las Vegas with pockets even more full than theyd been before. And Vegas provided a haven for the festival, a place where they could throw the largest dance event in the United States. No move is easy. But this particular move proved to be a complete nightmare, logistically speaking. Traffic flow was the worst Ive ever experienced – an hour long wait to get parked, and two hours to get out of the parking lot after the festival due to absolutely no guidelines, staff, or regulations. It was a glimpse into what might happen on the roads if there were absolutely no rules; people cutting each other off, honking and scowls galore, and people creating their own lanes, both on and off the street (I watched a man in a Scion XB high center his car on a small dirt berm in an attempt to break free from the line and head for the exit). Traffic flow was complete anarchy. In addition to that, the security line took well over an hour to get through each night, mainly due to heightened security in attempt to avoid a re-visitation of last year. Each individual was thoroughly ID-ed, then checked so scrupulously it took two minutes per person to be checked. Its a wonder any drugs made it in at all (because they certainly did) after such thorough screening. And then finally, once youd made it through the hell of parking and security, there were no festival grounds maps to be found. I mean, they were around, but probably under-printed by about 40,000 each night, so it was up to the festival-goers to get acquainted with the grounds themselves by wandering aimlessly through the sea of lights, people, and heavy bass. So there are some minor tweaks that need to be done before next years installment. But overall it was worth it and a complete success for the festival-goers, the organizers, and the city of Las Vegas. It will undoubtedly be returning next year. Oh, and did we mention how great the music was? Heres the part where we give you the day by day breakdown.